Linville Falls is an unincorporated community at the junction of Avery, Burke, and McDowell counties in the U.S. state of North Carolina. The community is named after Linville Falls, a nearby waterfall in the Linville Gorge Wilderness. Linville Falls is close to many of western North Carolina's outdoor attractions. The Linville Falls Tavern was listed on the National Register of Historic Places in 2000 and the Franklin-Penland House in 2006. This article about a location in Avery County, North Carolina is a stub. You can help Wikipedia by expanding it. This article about a location in Burke County, North Carolina is a stub. You can help Wikipedia by expanding it. 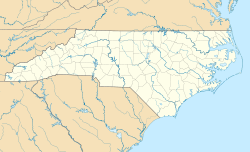 This article about a location in McDowell County, North Carolina is a stub. You can help Wikipedia by expanding it. This page was last edited on 27 July 2018, at 13:06 (UTC).